My Voice, My Life is experienced documentarian Ruby Yang‘s ninth feature-length film and one of eight CAAMFest documentaries I watched this year. Yang is best known for her Oscar-winning short The Blood of Yingzhou District. In many ways My Voice, My Life reminds me of a documentary from CAAMFest 2014, The Road to Fame. 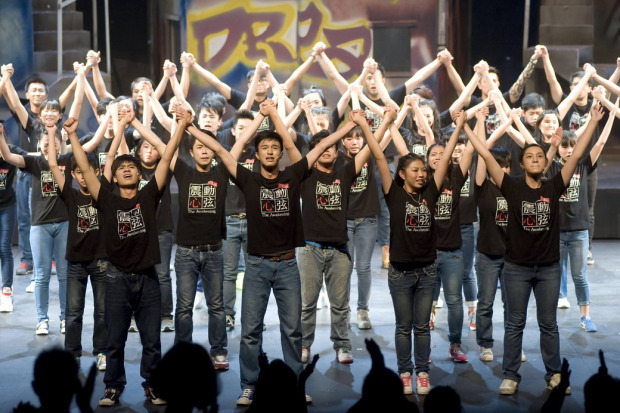 Both films focus on Chinese youths participating in a production of a musical. But where The Road to Fameshowcases aspiring actors from China’s most famous drama academy (which graduated the likes of Zhang Ziyi), My Voice, My Life features troubled secondary school students in Hong Kong’s undesirable, so-called “band 3” schools. The film doesn’t provide any details about how the children end up at these schools, but many of them have behavioral problems, physical or learning disabilities (in fact, several of the teens in the musical are blind), or poor academic performance. The documentary is also unclear about how this teen arts program originated or its exact mission, but viewers can infer that it was likely created with an “arts therapy” notion in mind, to provide a positive activity for these kids from difficult circumstances; many of the adults interviewed talked about “boosting self-confidence,” for example. On that score, the film is unmitigatedly hopeful (its credits a montage of happing endings)–as well as genuinely moving. The film could potentially have been much more moving, however, if it had provided more than a frustratingly superficial glance into the lives of the students it highlights. One teenager is a troublemaker, but we never find out why. Another claims to be on bad terms with his father, but we receive no insight into their relationship. Yet another student became blind a year prior to the film’s shooting, but we never discover what caused his sudden impairment. I understand the need to balance the kids and their families’ privacy with the desire to tell a compelling story, but if privacy is such an important issue, perhaps there’s no story to be told, after all. The Road to Fame, by contrast, provides a much deeper look into its subjects lives. As a result, we get a fuller sense of their histories, better understand their yearnings, and care more about their journeys as they try (and often fail) to achieve their dreams. The outcomes for the students in The Road to Fame are much more mixed, but that’s life. Next to The Road to Fame, My Voice, My Life smells a bit like promotion (albeit well-executed promotion). Maybe it is indeed promotion since the organization that sponsored the film (L Plus H Creations) is the same one that put on the musical.